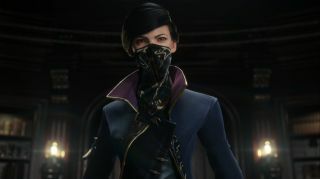 Playing Dishonored 2 as Emily will be "all new"
Dishonored 2, as we know, can be played as either Emily Kaldwin, the young Empress at the center of the first game who's grown up to be a powerful assassin, or Corvo Attano, the former Royal Protector, who saved her life. And the choice will be more than just cosmetic: In the world of supernatural assassins, Emily is a scalpel, while Corvo is more of a big rock with sharp edges. "If you play as Emily it’s all new—she has her own set of powers, her own assassinations and animations, so she feels different, she feels like a finesse character. In the video, we show a power called Far Reach [a teleportation ability] which can be upgraded in different ways, and it changes your flow through the world and your mobility. Just on a videogame level, moving through the world feels different," Harvey Smith, the co-creative director at developer Arkane Studios, told The Guardian. "But if you play Corvo, it’s all this classic stuff, it’s the rat swarms, it’s possession, it’s stopping time—he feels more heavy and brutal, he’s an older guy." Smith didn't say how the Emily/Corvo choice will be handled, whether it will be a one-time pick at the start of the game or an option at the beginning of each mission, or something else entirely. But the sequel will offer the same sort of "multiple path" approach to gameplay as the original, with different approaches to different situations, and actions will again have consequences. "A game about an assassin where you don't have to kill anyone—that was our goal with Dishonored," he said. "And that's true again with the sequel."